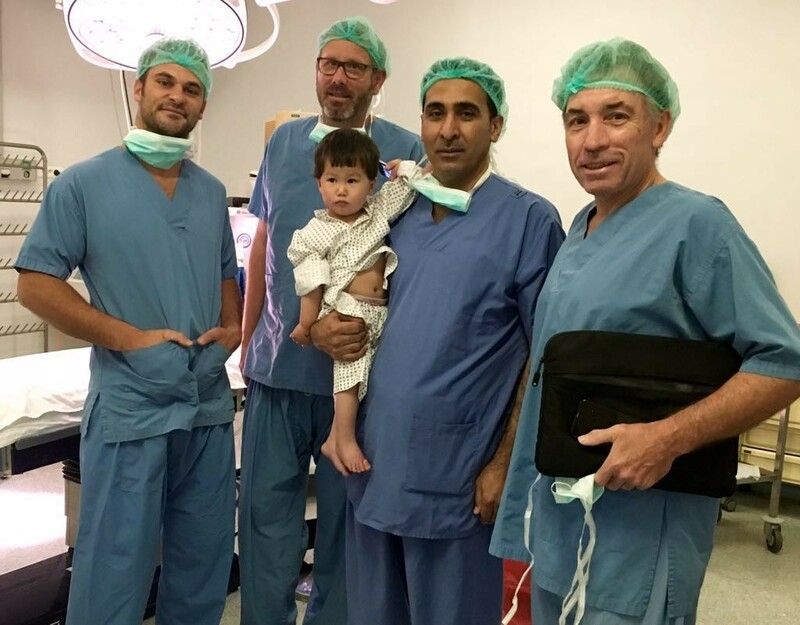 Between 8 and 10 September 2017, the doctors P. Valenti (surgeon), T. Lafosse (surgeon) and G. Dumenil (anaesthetist) spent the weekend on an orthopaedic surgery mission at the French Medical Institute for Mothers & Children in Kabul. The objectives of this mission consisted in consultations, operations and training of the Afghan team in child upper limb surgery. 50 children have been examined during two days of intensive work. 20% of them were examined for postoperative monitoring following previous missions. Among the 50 children, 12 have been operated on by Dr Valenti and Dr Lafosse, in collaboration with the Afghan team composed of two senior surgeons and seven junior ones. La Chaîne de l’Espoir covered for all the medical, transport and accommodation expenses for four of the patients and their families, as part of the Children’s Pavilion, its programme designed to promote access to healthcare to the most destitute children. Five more children will be operated on during the next orthopaedic surgery mission scheduled in April 2018. Most of the children treated suffered from injuries to the brachial plexus. These are often complex pathologies due to the fact that they are not treated on time. Injuries to the brachial plexus are generally due to normal vaginal deliveries carried out at home, without anaesthesia or any competent staff. At FMIC, particular attention is paid to the treatment of these children but also to the improvement of birthing conditions for women and neonate care, with the use of top-notch equipment and the assistance of a trained medical staff. A such, La Chaîne de l’Espoir organises regular missions to strengthen capacities for gynaecologists, midwives, paediatricians/neonatologists, nurses and anaesthetists. Dr Valenti and his team have praised the strong motivation of their Afghan colleagues, who are eager to expand their knowledge. The next step would be to develop microsurgery. Initial steps have already been taken during that recent mission.